What is probate? - Which? Who is the executor of a will? Becoming an executor: frequently asked questions What if probate is contested? In our video, we explain the probate process and how to administer the estate of someone who has died. Need help with probate? Download our free checklist from Which? Legal to help you through the process. Technically, 'probate' refers to getting permission to carry out the wishes within someone's will, though the term also applies to the whole process of settling someone's estate. If you're responsible for executing someone's will, there are specific rules that set out how you notify the authorities and distribute the estate. For permission to manage this process, you'll need to apply for grant of probate, or grant of confirmation in Scotland. There are separate rules if someone dies without a will, otherwise known as dying intestate. Appointing a professional can be a good idea and, if you are dealing with a complex estate, could be essential. See the guide to probate solicitors for more information on how to decide. If you choose to administer the will yourself, you'll need to fill out the relevant forms (and, in England, apply to the Probate Registry) to obtain the right to act as an executor. We explain how to do this in our grant of probate guide. You'll then need to gather in all the deceased person's assets and distribute them to the beneficiaries. This will involve notifying banks, building societies, relevant government departments (such as the council and HMRC) of the person's death, settling up any accounts they hold, tallying up their assets and liabilities, paying off any inheritance tax that might be owed, and then distributing their assets. See our guide to DIY probate, for a step-by-step explanation. 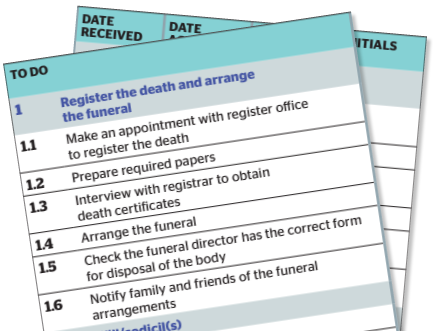 Find out precisely what you need to do with our downloadable probate checklist from Which? Legal. Breaks down every stage of the process into manageable tasks. The person who administers probate is known as the 'executor', and is generally appointed in the deceased's will. In most cases, the executor will be a family member or friend of the deceased. But it's also possible to appoint a professional executor, typically a solicitor or will writer. Professional executors will expect to be paid from the proceeds of the estate for carrying out this duty. They normally carry out the entire probate process and receive a fee for this, too. Often, your first experience with probate comes when a loved one dies, and you're named as their executor. Below, we round up commonly asked questions from first-time executors. How is the executor chosen? In most cases, the person responsible for administering an estate will be chosen by the deceased and specified in the will. Typically, it will be a close friend or family member, or a legal professional, such as a solicitor. The deceased does not necessarily need to ask you, or seek your permission, before naming you as executor. If there is no will, the deceased's estate will be subject to intestacy rules, and the estate will be administered by the next of kin. The executor named in a will can also be a beneficiary, meaning they are able to inherit assets from the deceased. In fact, it's common for a person to appoint one of the major beneficiaries as their executor – for example, their partner or one of their children. Can you have more than one executor? In many cases, a will may appoint more than one person to administer the estate, known as Joint Executors. ensure oversight over executors' work. If you're appointed as a Joint Executor, you'll need to work collaboratively with the others to ensure probate is managed effectively. If you're named as the executor of someone's will, you can decide whether to settle the estate yourself, or to appoint a professional to work on your behalf. Alternatively, you can decline to be the executor – if, for example, you don't have time or you're too unwell. In this case, you'll need to sign a Renunciation, essentially resigning from the position. This won't affect any entitlements you have as a beneficiary. Another beneficiary may have to step up, or a professional will need to be employed to take your place. How long does executing a will take? The process can take a long time, even with a straightforward estate comprising just one or two bank accounts. Generally, it will take around six to nine months from when the person dies, until the assets are distributed to beneficiaries. You should consider whether you're able to take on this time commitment, or whether you'll need assistance. Do I need to apply for grant of probate? In the vast majority of cases, you'll need to apply for grant of probate before you can settle someone's affairs. However, it may not be necessary if the deceased's estate was worth less than £15,000, or if their assets were held jointly and are passing to a surviving spouse or civil partner. To find out how to make your application and what you need to do, read our guide on grant of probate. How can I find the will? It's most common for a person to keep their will in their home, so the first step is to search the deceased person's house. Safes, filing cabinets and locked drawers are obvious starting points. Obviously, you'll need the permission of the deceased person's family before you do this. If the will isn't kept at home, you can also ask their bank, as it may be stored in a safe deposit. Similarly, if they used a will-writing service, or a solicitor, it is possible that they hold the document. How can executors find beneficiaries? In the will, the deceased will name all the people who are due to receive assets from the estate – known as beneficiaries. As executor, you need to take reasonable steps to try and contact everyone. The executor is also responsible for finding creditors, which can be identified from outstanding bills, or loan agreements. To find out more about your obligations as an executor, read our guide on DIY probate. What if probate is contested? There are several ways which probate could be contested, which could prevent you from being given a grant of probate. In some cases, a beneficiary or relative of the deceased may enter a caveat, which can prevent or delay probate being granted. This might happen if two people are entitled to apply for probate, or if there are questions about the legitimacy of the will. If a caveat is placed on the estate, then the person who placed it will need to state their reasons within eight days. If this doesn't happen, the caveat will be removed. If it does happen, it is a matter for the courts to resolve, so the caveat can be removed, and probate be granted, to whichever party it deems appropriate.